A couple weeks ago I attended a fascinating Real Estate Summit event put on by Atlanta REALTOR Association (aka the Atlanta Board of REALTORS) and the Atlanta Business Chronicle at the Federal Reserve Bank in Atlanta. I wanted to share what Federal Reserve Bank of Atlanta Supervision and Regulation Division Senior Financial Policy Analyst Domonic Purviance shared with us, and what it means for all of us. Metro Atlanta is #3 in the nation for job growth behind Dallas and NYC. 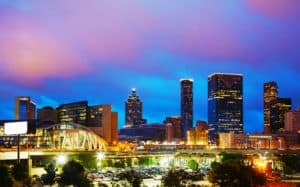 Employers are flocking to a still affordable Atlanta filled with a young educated applicant pool. Atlanta is at 4% unemployment which we consider to be full employment. We assume that 4% of the population is unemployable. The increase in job demand is starting to push wages higher, which is the only way we can survive rising home prices AND rising interest rates at the same time. Atlanta is #4 in home affordability behind Chicago, Minneapolis and Detroit. This should fuel growth in our city and region for years to come. Atlanta expects 4M more people by 2040, and these people need housing. This will continue to drive prices up throughout the area as well as fuel new construction housing starts. Atlanta is #3 in housing starts behind Dallas and Houston. Atlanta loves them some new construction. We’ve always had an insatiable appetite for all things new, thus why we are known as a bit of a, ahem, sprawling city. Atlanta has a 2.7 month supply of inventory, which is less than the national 3.5 month supply. While we recognize Atlanta is hot, it’s interesting to see this same shortage scenario playing out across the nation. With rising prices, we should see more home equity lines and moves precipitated by a desire to free up cash and/or move up. Atlanta currently has 10% of the nation’s vacant and buildable lots, which is a significant number. You can expect a changing landscape and more nails in your tires in suburban Atlanta for a while. Cities positioned to take advantage of the new construction demand due to available lot inventory include Atlanta, Orlando, Houston, Dallas, Austin, Phoenix, and Chicago. It’ll be interesting to see how these growing metro areas capitalize on their open seats. We are all VERY fortunate to be in an area like Atlanta. In short, our market is on fire right now, and the country is taking notice. Maybe you are wondering about the value of your home. We would be delighted to pull a free market snapshot for you. You can reach us at 678-921-1470 or www.thepeterscompany.com today.